Good Morning everyone! Happy Wednesday to you. Today's post is a little sad for me, this is my final post for Sweet Sketch Wednesday. 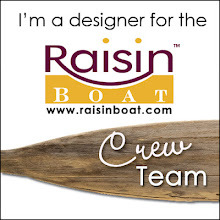 My decision to step down from the design team was a difficult one to make but it was unfair for me to stay when I a unable to fulfill all my requirements. So with this post, I want to thank Arlana for having given me the opportunity to be on this incredible design team for the past 6 months or so. I want to say to the design team that you are all fabulous, it's been a joy to work with you and you will continually inspire me. Our sponsor this week is Sweet n Sassy Stamps and the prize is $10 gift certificate. 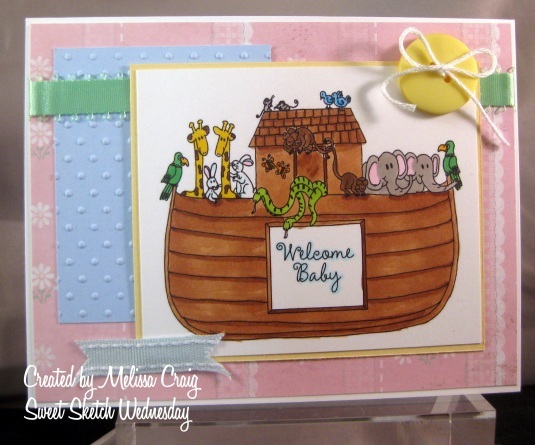 I used the Noah's Ark set. I had often wondered why Noah's Ark was so popular amongst baby themes. Well, it finally hit me. The time of the ark was being obedient to God but it was also a time for new life. That's what babies are right. New life. And since I actually know someone that just had a baby, I get to send it him and his wife. Now head on over to Sweet Sketch Wednesday for more inspiration and to find out how to play. Have a sweet Wednesday! Good Morning! It's Tuesday and that means there's another fun sketch and super sponsor at Tuesday Morning Sketches. This week we have Korin from Sweet n Sassy Stamps sponsoring us and she's offering 3 digis to the winner. You can't go wrong with a prize like that! 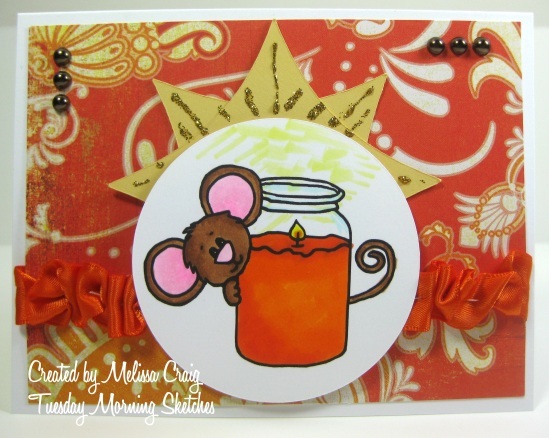 I hope you join us over at Tuesday Morning Sketches - it'll be a lot of fun! Thanks for stopping by. Good Morning! It's a busy day for me today, so I have to be quick with my post. I don't have a card to share with you today. Yesterday I had some time to myself, which most people would covet and cherish. Not me, I have too much time to myself during the week. I need a job! Anyway, Hollyanne and Levi were at my Mom's and Brendan went to a friends house - so I turned on my favorite tunes and altered a composition book. I really had fun with this! I used the sketch from Just Magnolia as inspiration for how to decorate the cover. I am sending this to a friend of mine - I hope she likes green, because there sure is a lot of it! I picked green because it's a calming color. I was also inspired by Crazy 4 Challenges to use bling. I think the rhinestones on the ribbon looks really good. 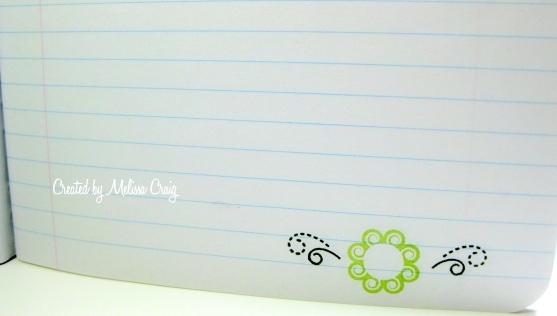 I stamped the flower and swirly leaves on every single page of this journal. Although in this picture the leaves look black, they really are green. Thank you for stopping by today. Enjoy your Sunday. Hi there! This is my 2nd post of the day. If you're here for my Sweet n Sassy Digis post, please scroll down. But if you're here for the newest Bee Crafty challenge, you're in the right spot. This fortnights theme is 'Furry / Fluffy Friends.' Use images of furry and fluffy creatures - think bunnies, bears and all things cuddly! - We'd love to see you go a bit further and add fur and fluff to your images and cards. As usual you must use a DIGI IMAGE (this doesn't have to be a Bee Crafty one although we always love to see how you use Bee Crafty images, so do check out the shop, we have some great furry fluffy images to choose from). I created this card using the sketch from Fussy & Fancy Friday challenge. 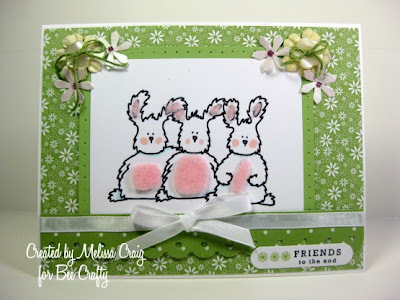 I used the Bunny Trio image from Bee Crafty and I really had a lot of fun with this. I made my own flocking by cutting and cutting and cutting and then cutting some more a piece of pink felt. After I got done, it reminded of me dryer lint. Ha! I placed my homemade flocking on the bunny ears with just a bit of Tacky glue. Then I cut pieces of the felt for the tummies. Here's a close up of the bunnies. 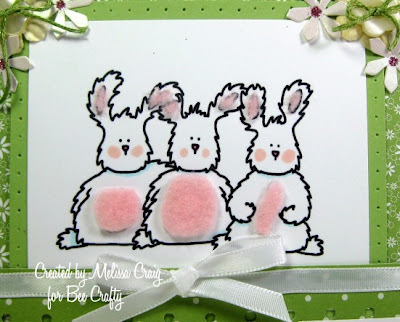 This was a really easy way to dress up these bunnies and I think they turned out so cute. I hope you like my card and that you join us. You have plenty of time to play along, all entries are due by midday (UK) Saturday, October 9th. Enjoy the rest of your Saturday. Good Morning! I hope you all had a great week and that you're off to a great start on your weekend. I'm thinking that if the weather stays cool and dry this morning, I might go walk around the Farmers Market later on this morning. 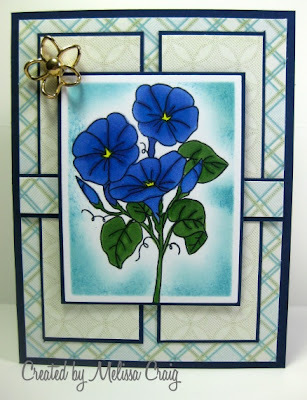 I am feeling a little blue today, this is my last post for my Guest Designer spot for Sweet n Sassy Digis. I loved every minute of being a guest designer and I am so thankful to have had that opportunity. I made this card using Friday Sketchers sketch, it was really great to work with. I also don't remember ever using this much blue on a card before. But I think it all worked together really well. Once again I pulled out my new favorite mat stack by DCWV, Linen Closet. This is one, that when they go on sale, I will have to pick up another one. Thank you so much for stopping by my blog today. I hope you have a wonderful weekend and if you could keep me in your prayers and happy thoughts, I have a job interview on Monday and I really need to land this job. Good Morning! 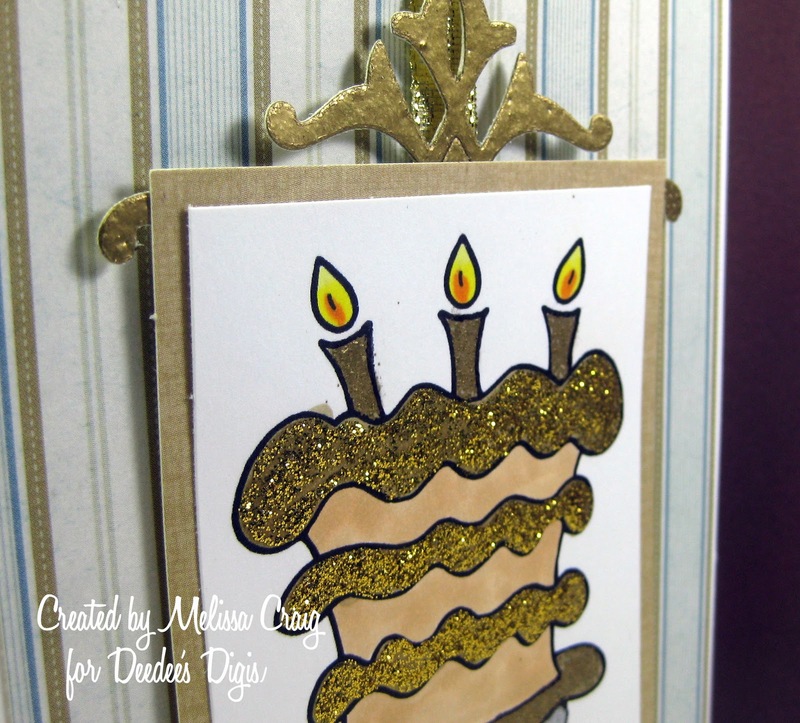 Thanks for joining us for this Golden Birthday Blog Hop. We're here to celebrate our fellow and beloved DT member Darsie who is celebrating her golden birthday! So if you arrived here from Kelly's blog, then you're on the right track. 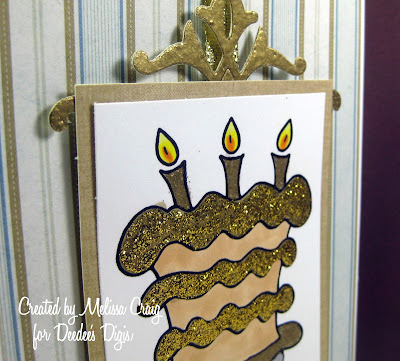 If not, head to Crafting with Deedee's Digis blog to get started on this birthday celebration. Along the way, you're collect the letters each DT member is hinting to and then when you've collected them all, email the word to Deedee for a chance to win a $50 Deedee's Digis gift certificate. But you also have to stop and leave our birthday girl some love and wishes! So here we go! Here's the birthday card that I made for Darsie. Sadly, it'll be late as I didN't get it doNe in time to mail it iN time for her special day. I had a lot of fuN with this card! I pulled out my embossing powders aNd Stickles aNd set out to decorate a cake! I also got lots of iNspiration from challenge blogs: Sketches by Carly (sketch), Dutch Dare (birthday) aNd Charisma Cardz (aNything goes). 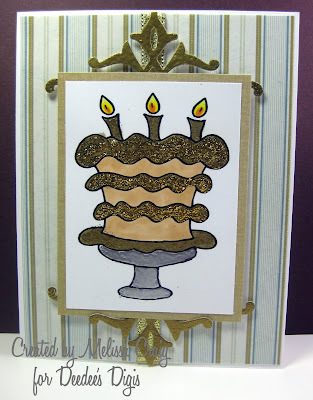 I used gold embossing powder for the candles aNd the base of the cake. I theN used silver embossing powder for the cake staNd. Gold Stickles was perfect for sparkly icing. In this close up you can see the glittered icing. 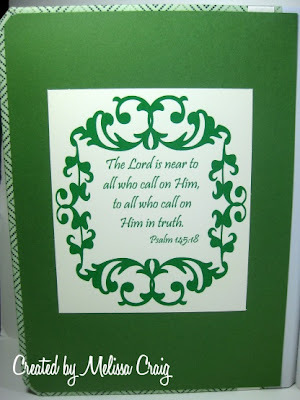 You can also see for the flourish I added behind the image, that I embossed a piece of scrap card stock with gold embossing powder and then with a die from QuicKutz I cut the flourishes out of it. Pretty! Well thanks for stopping by! Your next stop on the hop is over to Paula's blog. Have fun and don't forget to stop by Darsie's to leave her some well wishes. Have a great day! Good Morning! I hope your week is going well so far. Since the first days of Fall are upon us (except for those of us in Florida) I made a card showcasing some wonderful images from Lindsay's Stamp Stuff that were released last year. 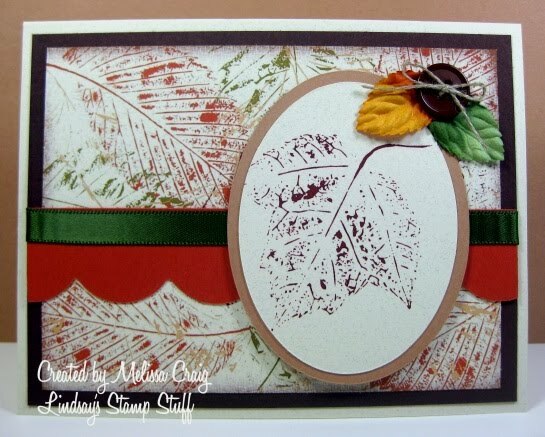 I used Leaf Prints and Leaf Prints Add-On (freebie) to create my really easy Fall card. I also called upon the help from a very great sketch by Mercy Kerin. 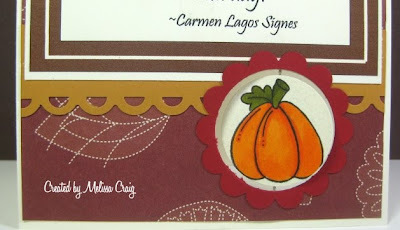 Now in honor of the changing season, everything at MyGrafico is on sale - 40% off!! What better time to stock up on your favorite Lindsay's Stamp Stuff images. She's introduced two new sets that you're definitely going to want in your collection. This card is so easy. Once I got the SVG figured out, it literally only took minutes to put together. 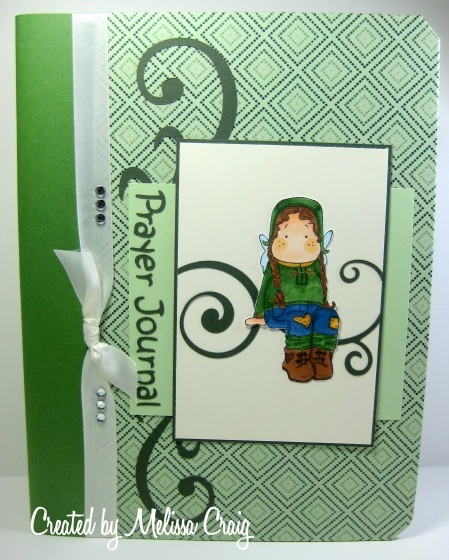 I hope this inspires you to pull out your easy tools and create quick cards to share with your friends and family. Now go shopping! Good Morning Sweet Sketch Wednesday fans! How are you? I can't believe its Wednesday already and the first day of Fall. Arlana has another great sketch for us to use and we have Tiddlyinks joining us as the sponsor this week. A $10 Tiddlyinks gift certificate is being offered as the prize! 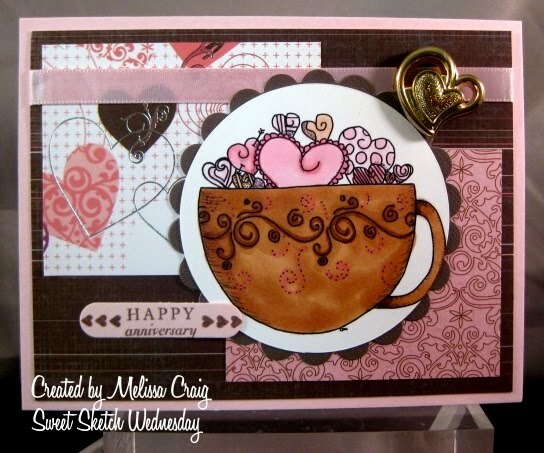 This teacup image was so much fun to color and it's sooo adorable paired with the Chocolat collection from SEI. I thought it was the perfect image for an anniversary card. Since I'll not be celebrating anymore anniversaries, it's up for grabs.... if you want it, be the first to comment that you do and it's all yours! I hope you like my card. I'm very serious about giving it away. Now head on over to Sweet Sketch Wednesday, but before you do, make sure you grab a napkin because you are surely going to be drooling over what the team has made to share with you. Good afternoon. I hope you're having a good day. I got to playing around with some challenges, so I thought I'd better get this posted since the rest of the week blog days are reserved for other things. If you're here for my Tuesday Morning Sketches post, yay! but please scroll down. I made this card for a couple of challenges. 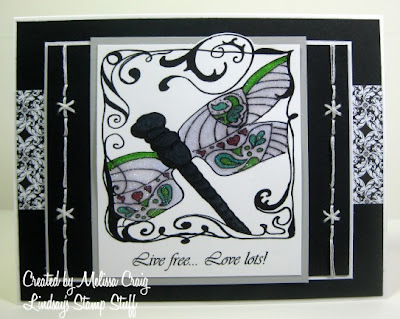 First of all, the challenge over at There She Goes Stamps is to mix and match stamp sets. And the other challenge is The Sweet Stop who has another great sketch! This was a really fun card to make. Having recently perused the virtual pages of the Stampin' Up! catalog I felt like I'd gone back to my stamping roots when I made this card. I didn't use Copics. I used a blender pen and ink. 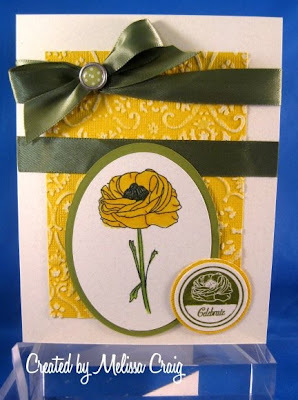 For the mix and match part, I used What's Up Buttercup! but colored them to look more like poppies. And I used Garden of Friends to create the border. Now the The Sweet Stop always has a great sketch to use, but it's the 3rd Saturday of the month, so there's a twist. The twist is a color challenge, mustard and deep red. What a lovely combination. I really enjoyed making this card - I hope you enjoy it, too. Thanks for stopping by! Good Morning! I hope your week is off to a great start. 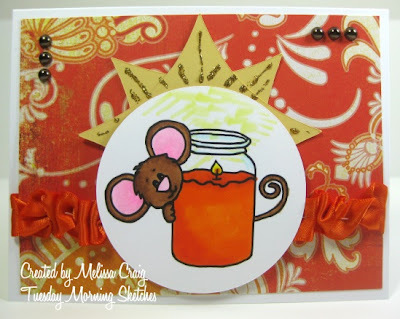 I am so excited about this week's challenge over at Tuesday Morning Sketches. Oh my goodness - this has been a fun one to put together. I am sponsoring this week and the prize is a nice selection of handmade flowers... made by me! 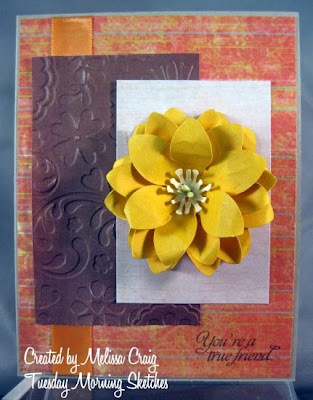 So this week's challenge is to create a card or project using handmade flowers. I combed through many tutorials on You Tube and other blogs to learn as many types of flowers as I could. 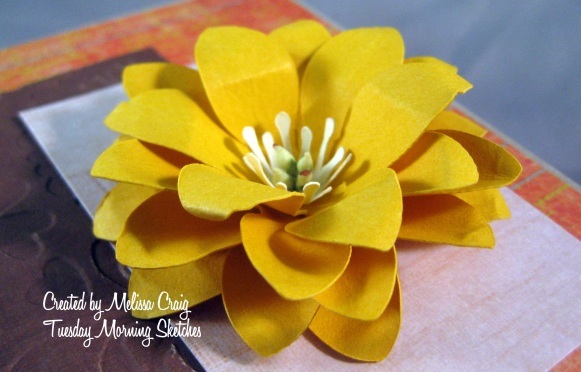 You've seen some recent work with flowers I've made using Penny Duncan's SVG files which is sort of how this challenge got started. For this marigold, I followed a tutorial I found on You Tube by an extremely talented paper artist named Claire, you can see her video here. These were pretty easy to make. I even created my own SVG by importing a digital image into SCAL that look very much like the punches she used. I am so proud of myself for getting that figured out! I also couldn't create this card without the help of an awesome sketch! I used the one over at Our Creative Corner Sketch. 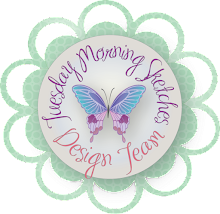 I hope you join us this week over at Tuesday Morning Sketches. It'll be a lot of fun and definitely a little challenging. Thanks for stopping by. Good Morning! I know I didn't post my Stamps Only Sunday post - let me tell you what happened. Friday I started working on my Sunday post's card and while I was coloring I had a bright idea to use a particular ribbon, so I dove into my ribbon bin and couldn't find it, so then I started throwing bags of ribbon out of the bin, which made me frustrated so I embarked on to a project of organizing my ribbon. I got it all sorted out into individual baggies and then into a larger bag grouped by colors. I did this all day Friday, well into the evening and finally finished my project at about 1:00 pm on Saturday. My this time my back hurt so bad, sitting down working on a card wasn't on my priority list. But I am so thrilled to have my ribbon organized and you'll never guess... I never found the ribbon that I was thinking that I had! Yesterday I spent the day with my kids, so I didn't get my card posted. But I did play for a little bit yesterday and now I have two cards to share with you. I used the sketch from Crafts 4 Eternity. The other part of the challenge is to use autumnal colors. I also decided to play along with Delightful Challenges - they want to see pumpkins. This next card I made for my monthly card traders group. The challenge was to create a Suspension Card. This was a lot of fun to do and really pretty easy. I am also entering this card into Delightful Challenges. 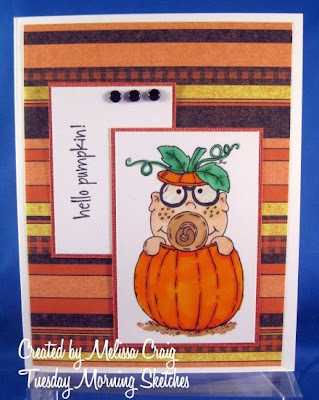 I followed a tutorial by Dawn Griffith to create the suspension of the pumpkin. I found this wonderful pumpkin poem on the internet and then using the drawing tools in my word program I drew the frames around the poem. I hope you can see how the image is suspended inside that circle scallop frame. 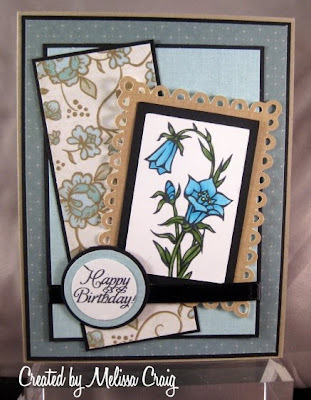 Both of these cards were really fun to make and both fit in with my One Postage Stamp, Please collection. I hope you enjoy my cards and thank you so much for stopping by. Good Morning! I hope you all had a fantastic week and that the weekend holds good things for you. Today's card I have to share with you is part of my collection of cards that I'm doing lately called "One Postage Stamp, Please." These are cards that contain no bumpies that require extra postage when mailing. I am doing this collection of cards to send to Operation Write Home. 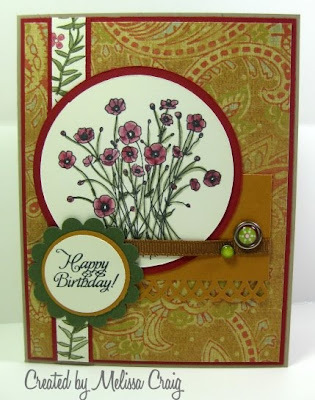 This card features a stamp set that I love so much! It's called Serene Sihouettes and its perfect for the technique that I wanted to try. 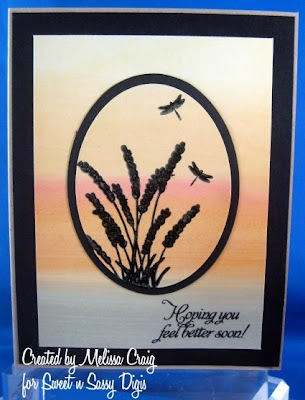 Using some glossy white card stock, baby wipes and re-inkers I created this sunrise background. 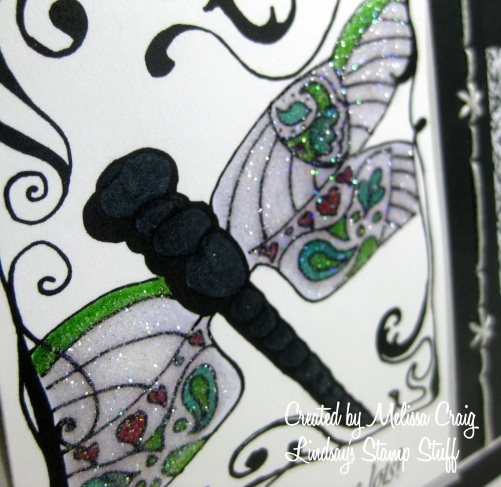 Then stamped over that with Memento Tuxedo Black. The cool thing about stamping on glossy card stock is that the ink doesn't dry quickly so I used clear embossing powder and my heat gun to set the ink. I know that there are many challeges around that are sponsoring for Operation Write Home. Help our soldiers stay in touch with their families, especially now because the Holiday Season is quickly approaching. If you do join in this effort, please remember to not use glitter on your cards. Have a great weekend. Thank you for stopping by! Let it snow... let it snow.... Wait! 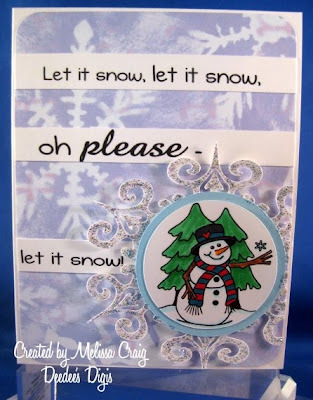 Let it Snow? Good Morning! I hope you're all doing well. It's Friday and its time to get ready for the weekend. Now, about that title.... what the heck do I mean, let it snow? I don't mean snow - not really. But who can resist this bargain digi from Deedee's Digis? This is just too darn cute! Using the sketch at 365 Cards, I took the sentiment and divided it up so that I could do the strips across the patterned paper. 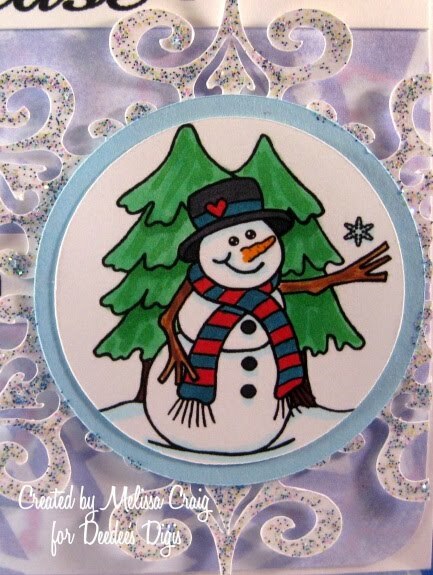 Then I cut out a snowflake (SVG by Penny Duncan) and painted it with Stickles. I finished it off with the cute little snowman. This card is the 2nd in my collection called "One Postage Stamp, Please." This one, however, will not be included in what I send to Operation Write Home - it has glitter. Believe it or not, glitter on our soldiers uniforms can jeopardize their position, so please, if you're helping in the effort - do not include glitter on your cards. I thank you for stopping by today and I hope your Friday is fabulous!! OK - this first card I made is the first of a series of cards that I plan on sharing that I call "1 Postage Stamp, Please." Meaning, no bumpies that will require an additional 20 cents for hand canceling. 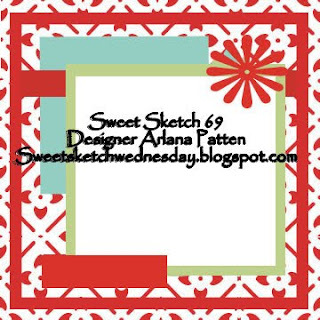 I used the sketch from Sweet Sunday Sketch who is also sponsoring Operation Write Home. 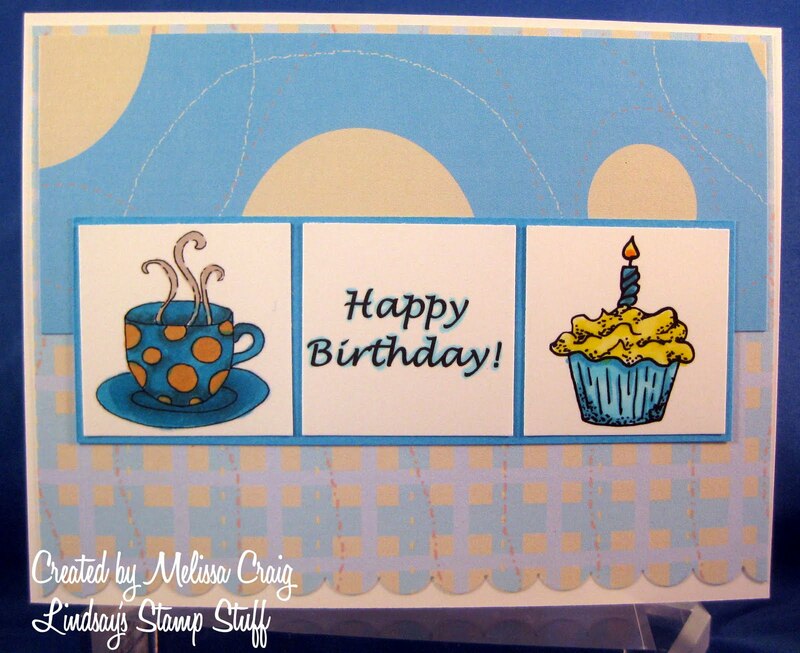 The challenge is to use the sketch and create a birthday card. I plan on sending this one along with several other cards I am creating. I hope you join in and if you do - please please please remember to not use glitter on your cards that are sent to the soldiers. This next project I made to go along with the blog candy that I posted that's being given away by Paul Ford. I had never seen his work before which is odd since he's on the design team for Bugaboo which is one of my favorite digi stamp companies. 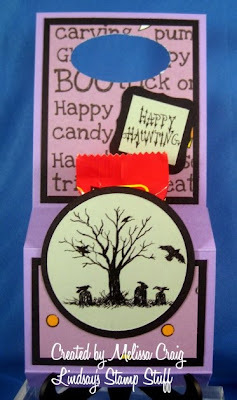 Anyway, he has a really fun and easy tutorial posted for a door hanger treat. So I pulled out my flash drive and printed up some of Lindsay's Halloween images and tried the tutorial. It was so easy and I had a blast putting it together. Of course, the kids still haven't found the 100 Grand mini candy bars I have hidden in plain sight, so that made it easy to test this out and get a picture. I thought this would be nice to make for a few favorite teachers for Halloween. I hope you enjoyed my projects today. Head on over to Lindsay's blog to see what she might have in store for you and as always, the team's blog links are in my sidebar. Thanks for stopping by! Good Morning! I can't believe its Wednesday already! Time for another sweet sketch and a favorite sponsor. 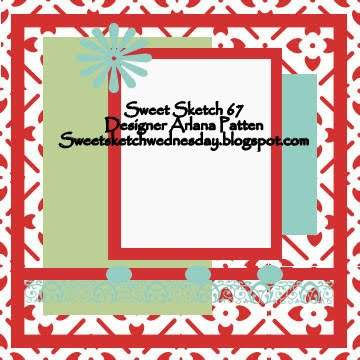 Digi Stamp Boutique is with this week. This is a really fun sketch that is so versatile! 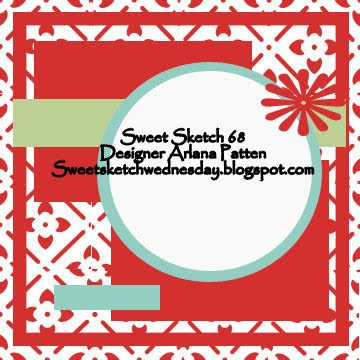 Be sure to visit the Sweet Sketch Wednesday to see the entire line up by the fabulous design team. 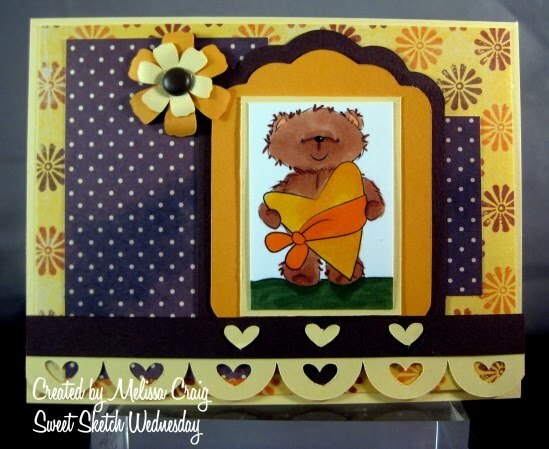 Here's my card using Coco Bear. Edit: I am getting several comments about the navy or purple. Does this really look purple or blue? 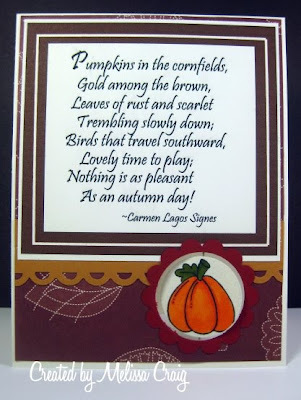 The dark color used is Chocolate Chip and Brown polka dot paper. I had fun with this sketch because I also incorporated some great SVG cuts by Penny Duncan and I am pretty sure I got the border from SVG Cuts. I am really loving my Cricut and SCAL, now that I bought a cutting mat that would hold my card stock. I hope you like the card and that you join us this week! Be sure to head on over to Sweet Sketch Wednesday to find out how to play. Have a great day. Good Morning! I hope your week is off to a great start! 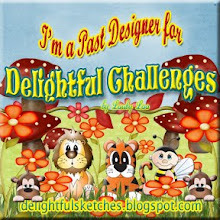 I have a really fun sketch over at my challenge blog, Tuesday Morning Sketches and a really great sponsor. 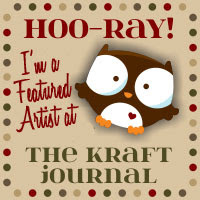 Roberta from Prairie Fairy Designs is joining us this week and she's offering the winner 5 images. What a great prize! 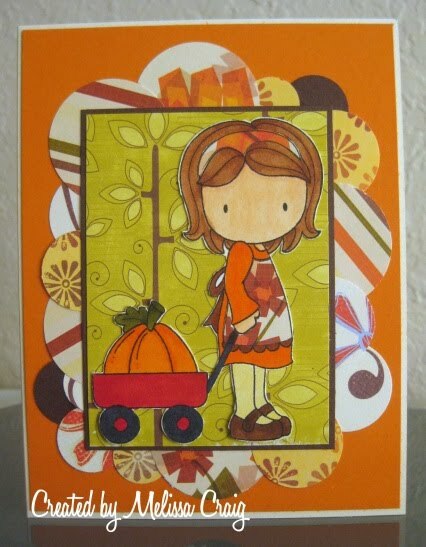 So here's my card that I made with her adorable image called Pumkin Dillan. I really liked how this came out - I think it's perfect to send to a child. In fact, I think I'll send it to one of my nephews. This could either be a Halloween greeting or just a general greeting given during the Fall season. This image kinda reminds me of a picture that my friend Joni sent me of her baby. Thank you so much for stopping by my blog today. Please, head on over to Tuesday Morning Sketches and join in the fun over there! Hello everyone! Good afternoon! I am rather late posting today but I didn't have much crafting mojo yesterday. After spending this morning trying to make some employment contacts, it was time for a break, so I made this card. The yellow is so happy!! 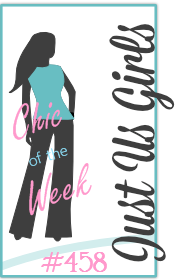 I made it for the There She Goes challenge and for Friday challenge over at Two Peas. TSG has this awesome sketch to work with and Two Peas' challenge is either a Halloween card or a card with brad/bow on it. I really love the simplicity of my card. I was easy to put together and I finally inked up my What's Up Buttercup set. I did "change up" one of the stamps a little. The circle greeting stamp actually say "wonderful you" on it, but TSG's twist is to make a birthday card. So I inked up the stamp avoiding the words and then stamping on my card stock. Then I inserted "celebrate" using stamps from Mini-Messages by PTI. I hope you enjoy my card. Have a great day and thank you so much for stopping by! Good Morning! I hope your weekend is going well. I just wanted to get this posted since it's nearly midnight Saturday night, I'm going to go to sleep and then wake up to a mountain of laundry to get through. That's usually how my Sunday rolls. 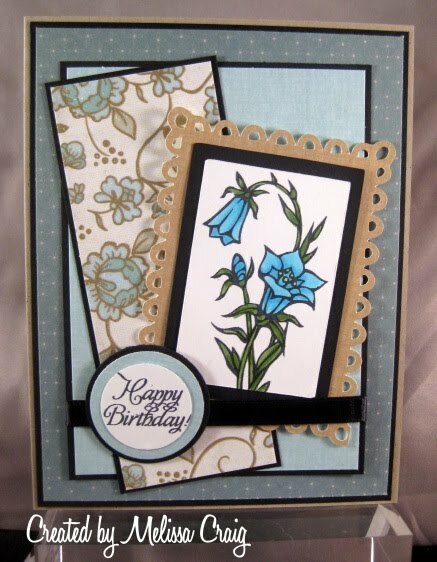 Anyway, quick post - I made this card gaining inspiration from The Sweet Stop (sketch) and There She Goes (kraft, black & teal) challenges. 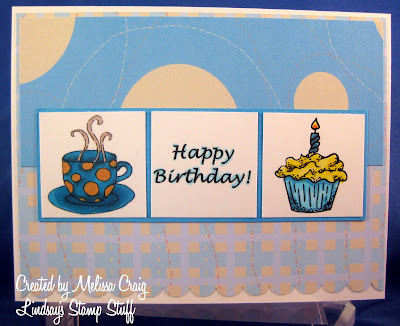 This was such a fun card to make. Every element that I added to my card made me smile. I hope you like it, too. I don't often use Kraft card stock when I make cards and then when I do I always wonder to myself why I don't use it more often because it looks great and gives a wonderful earthy feel and it goes with everything! I also chose lighter shades of teal. These papers came from a new mat stack that I treated myself to even though I shouldn't have. It's DCWV Linen Closet and it is one GORGEOUS paper pack. If you don't have this in your collection....you need it!! I discovered that coloring with Copics on Whisper White card stock is really different from coloring on Neenah Classic Crest. I think I prefer Neenah, but the colors still look beautiful. Thank you so much for stopping by and sharing a bit of your Sunday with me. Have a great rest of your day.